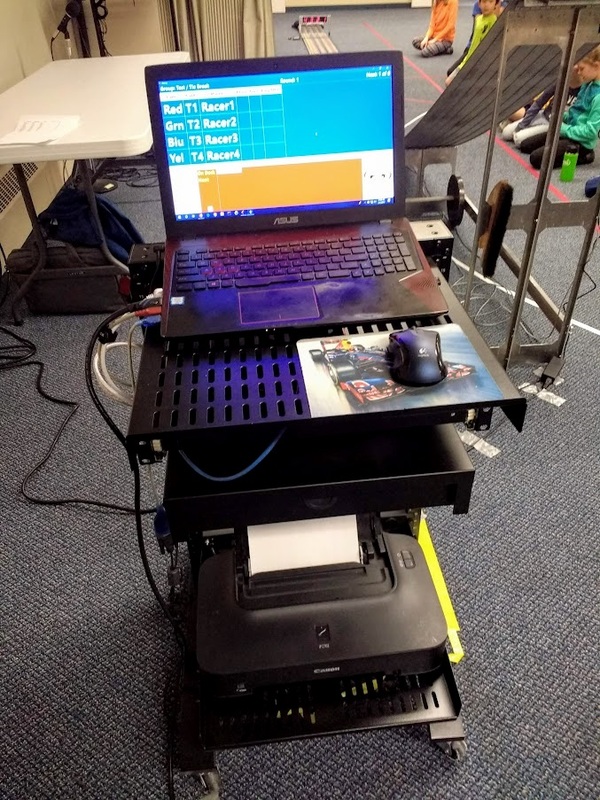 If you happen to be someone that runs multiple races a year, like I do, it might be worth it to have a dedicated computer cart. After so many years of doing races, I really wish I would have thought of this earlier. 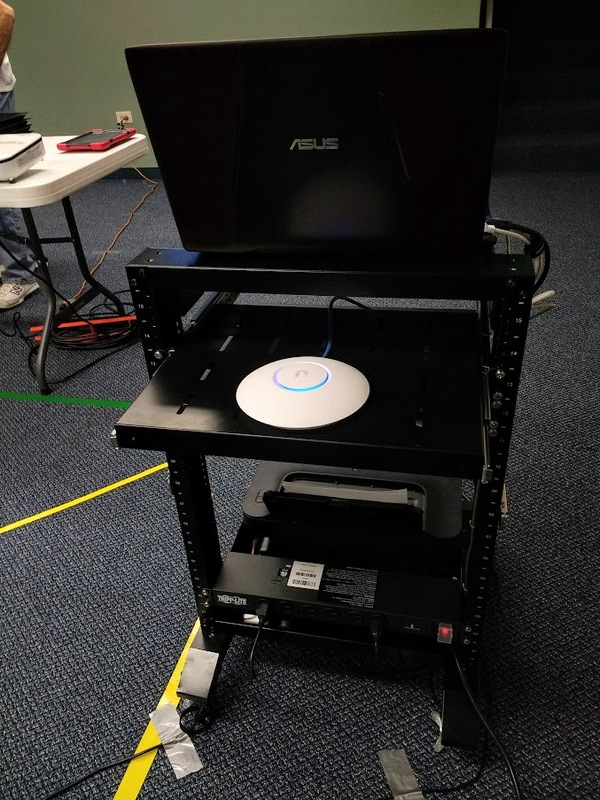 It makes setup and teardown much faster for me, as I can keep the printer and my wireless network gear, to run my DerbyWeb network, all setup on the cart. I just setup my laptop and plug in the cables for the printer, router and timer into it. The cart is also handy to get power to everything, like the laptop, solenoid gate and projector. 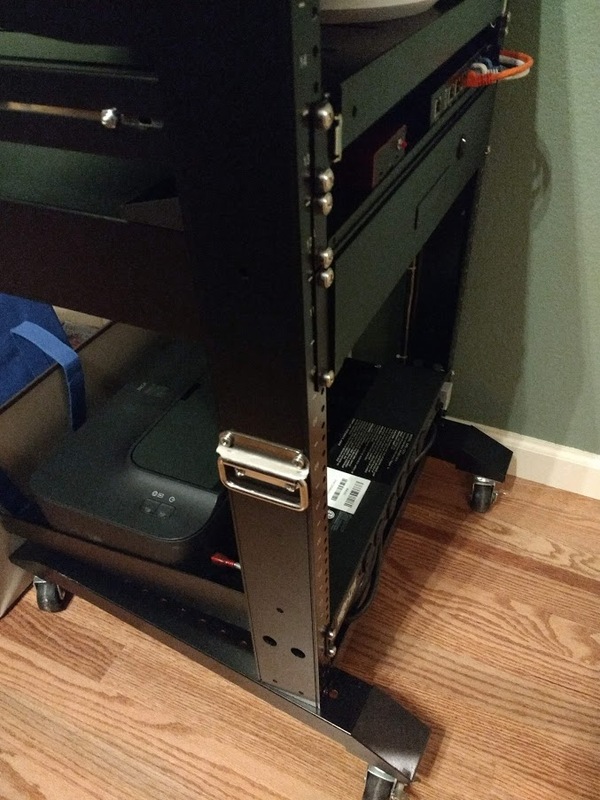 + The cart itself is a small mobile server rack. + Two 16" deep rack shelves. One mounted upside down on top for the laptop to sit on. The other is on the bottom of the rack for the printer. My printer actually fits quite snugly, so I don't even need to strap it down. + One pull out shelf with the wireless access point mounted to it. + One 6" deep rack shelf. This holds the router for the wireless network as well as a Raspberry Pi. The Raspberry Pi runs the UniFi controller software for the access point. + One 2U drawer. This is handy for storing my wireless access point, USB to Serial Adapter, digital race scales, derby car toolkit, various audio and video adapters, pen, and whatnot. + A rack mountable power strip. This has built-in surge suppression, which is important to protect the electronics. The power strip has a 15 ft cord, which is nice. The power strip comes in handy for the gear on the rack, but also for getting power to my solenoid gate. If I needed to run an extension cord to my timer, I could plug that in as well, but I actually like using a battery pack to power that. I put handles onto the sides of the rack to make it easier to load into/out of my SUV. The cart is just short enough that I can fit it into the back of my SUV with it standing up. I then lock the casters to keep it from rolling around. With the WiFi shelf pulled out. 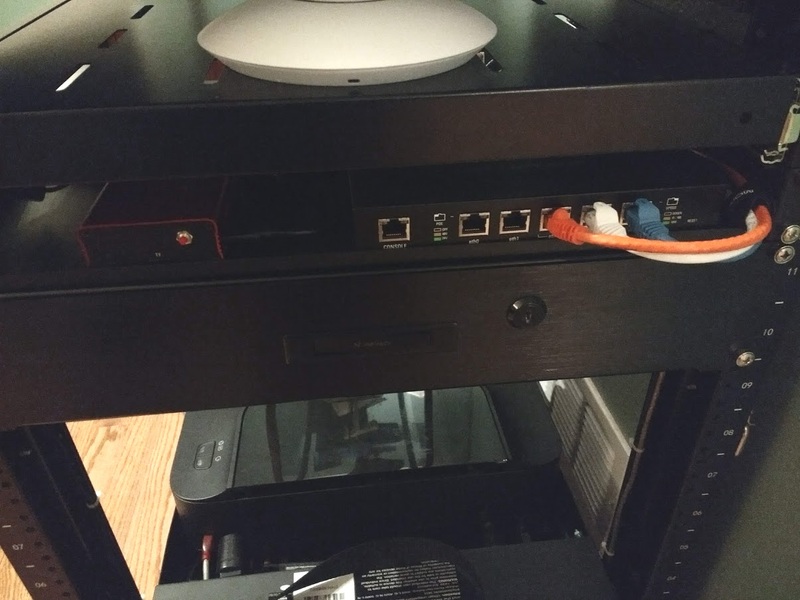 The shelf with the router and Raspberry Pi. Those are secured to the shelf with Command adhesive velcro like strips. Carry handles mounted to the cart. Used to lift the cart in and out of my SUV. Have you thought about having a cover made for it for those rain'y days when your unloading it out of your SUV and into a building. Maybe even having some pockets made into the cover for the extra cables and power cords and so on. Could you use something like a work light stand ... with and adjustable pole to mount the wireless access point on to raise it up. The work light pole could be bolted on to the back side of you'r rack. Or something like this this flex shaft stand that clamps on with and adjustable pole .. you would need to fab a base on it of some sort however. Last edited by whodathunkit on Fri Jan 18, 2019 8:02 pm, edited 1 time in total. Normally, that is not a problem. Though, I had thought of using a BBQ grill cover, if needed. I do still have my tub for my extension cords, cones, car carrying trays, and so on. Having this cart now, I was able to eliminate one of my tubs. So far, it hasn't been a problem with the wireless access point on the cart's pull out shelf. I updated my original post. I've added a pull out shelf for the wireless access point. It makes getting into the drawer easier. I also added handles to sides to help load it into and out of my SUV. After running several races with this cart, I am really liking it. The power strip on the cart and the drawer have been especially handy. I just have to remember to lock the drawer when moving the cart around.